It’s easy to say that a great salesperson is that person who continually closes, and this is true to a great extent. But in a new economic environment, a closed sale is not necessarily the sole measure for effectiveness of the salesperson and the sales presentation. There are several ways to measure sales and all of them can be used together to get a good picture. In addition, you can use a combination of metrics to determine how to set goals – and how to coach salespeople in the meantime. One of the most common sales analytics is revenue. For a business with only a few products and a few salespeople, it’s also a relatively simple leap to determine how much of the revenue was brought in through the sales force. But as products become more complicated and as the sales force spreads geographically, this determination is harder to make. The idea of using revenue as a sales metric is to take the total revenue and then break it down to relevant units, such as division, product, region, or salesperson. Once you have a hold on the numbers, you can determine how much revenue is generated by each product – and by each salesperson. Along with revenue is the concept of average sales. From the revenue numbers over a certain time period, you can determine average dollars. But you can also determine, by unit, division, region, or salesperson, the average number of units sold. Any comparison to an average is a helpful measurement tool, but you must remember that there are “average-breakers” who continually outperform, due to sheer skill, market forces, or product and salesperson position. One of the best ways to use average sales as an analytical tool is internal – determine which members of the sales team are below average, at average, and above average and go from there. On the organizational level, be sure to benchmark averages with others in the industry. For more detailed sales analytics, consider a ratio of closed sales versus what is in the sales pipeline. This measurement can tell you if the sales process is breaking down at the point of sale. For example, if a salesperson or unit has strong sales but consistently has an even stronger pipeline, they should be increasing sales by increasing the number of closings. This measurement can also point you back to issues with the product and competitors. As a matter of fact, you can take this measurement a little further and try to find out which clients in the pipeline have, in fact, gone to a competitor. Another ratio used as an analytic is new accounts to return customers. Most sales managers measure effectiveness of their divisions and salespeople based on the number of new accounts generated in a certain amount of time. But if you have a product line or industry that can generate income on a repeat basis, you should be measuring this. Out of the new accounts, how many become repeat customers within a particular time period? If this is a measurement that works for your organization and your product, use it. You may find that the sale is becoming the last point of contact instead of one of the first contacts. Or you may find that account management needs to be stepped up. But on the other hand, you may find that customers are returning again and again – which is a great measure of sales effectiveness. What about subjective sales measurements? There is argument in the sales arena about using analytics that are not based in the numbers. But why not see what happens to perceptions, customer service, and overall effectiveness of the salesperson before, during, and after the sales presentation? A customer survey is not necessarily a numbers-based analytical measure, but the client is going to be completely honest based on their feelings at the time. For example, a customer who is happy with the product will give a glowing review within 30 days, but what happens to that “high” after 60 or 90 days? What happens to their perception of the salesperson when the customer perceives that he or she is always around to help or that he or she has simply vanished? Subjective surveys, although not related to the bottom line, are a great way to measure effectiveness in both the long and short term. 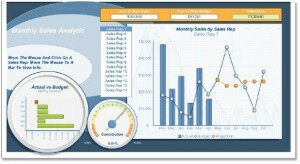 Sales analytics can be rooted in the numbers or in the subjective. The point is to use a variety of measurements to determine the effectiveness of the entire picture, that is, salespeople, sales presentations, the process, and after the sale.